After pressing Start on the title screen, you will be taken to the Game Menu screen. From this screen, you can continue an old adventure, create a new save file for a new adventure, or erase an old save file. Before you begin playing, you must create at least one save file to play with. When you create a save file, you will be given an opportunity to give your player a name containing up to four letters. 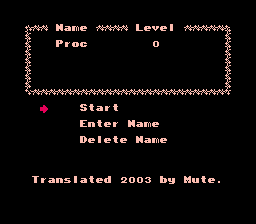 Once the name has been created, you can choose to start the game with save file that you just created. After watching the game introduction, in which a girl name Lottie appears while you are reading a story book and pleads for your assistance, you begin the game in Brick Village. You will notice a little girl waving to you. To speak with her, simply walk up to her. She will instruct you to go see the mayor. The mayor's house is the building directly above you. Walk inside and the mayor will ask you if your name is correct. Say yes, and he will inform you that the town came into existence when you opened the book and that the town is under attack. His daughter Alice was kidnapped, so he begs you to rescue his daughter and save the village. Respond with yes, and he will give you your basic equipment: a Water Gun and a Combat Suit. 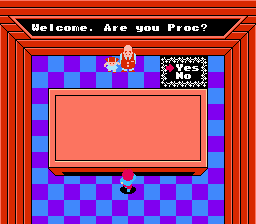 He suggests that you start with the warp zone in the upper left. 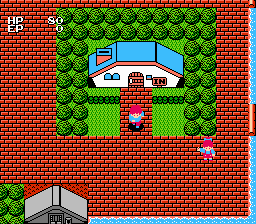 Warp zones are the completely gray building found throughout town. This page was last edited on 19 April 2009, at 17:27.